When he [Joseph] arose, he took the young Child and His mother by night and departed for Egypt, and was there until the death of Herod the Great, that it might be fulfilled which was spoken by the Lord through the prophet, saying, Out of Egypt I called My Son (Matthew 2:12–23). The Egyptian Church, which is more than 1,900 years old, and most likely the oldest Christian church in the world, traditionally believed to be founded by St Mark at around 42 AD, regards itself as the subject of many prophecies in the Old Testament. Isaiah the prophet, in Chapter 19, Verse 19 says "In that day there will be an altar to the LORD in the midst of the land of Egypt, and a pillar to the LORD at its border." The first Christians in Egypt were common people who spoke Egyptian Coptic. There were also Alexandrian Jews such as Theophilus, whom Saint Luke the Evangelist addresses in the introductory chapter of his gospel. When the church was founded by Saint Mark during the reign of the Roman emperor Nero, a great multitude of native Egyptians (as opposed to Greeks or Jews) embraced the Christian faith. The Catechetical School of Alexandria is the oldest catechetical school in the world. St. Jerome records that the Christian School of Alexandria was founded by Saint Mark himself. Around 190 AD under the leadership of the scholar Pantanaeus, the school of Alexandria became an important institution of religious learning, where students were taught by scholars such as Athenagoras, Clement, Didymus, and the native Egyptian Origen, who was considered the father of theology and who was also active in the field of commentary and comparative Biblical studies. Origen wrote over 6,000 commentaries of the Bible in addition to his famous Hexapla. All Christian monasticism stems, either directly or indirectly, from the Egyptian example: Saint Basil the Great Archbishop of Caesaria of Cappadocia, founder and organizer of the monastic movement in Asia Minor, visited Egypt around AD 357 and his rule is followed by the Eastern Orthodox Churches; Saint Jerome who translated the Bible into Latin, came to Egypt, while en route to Jerusalem, around AD 400 and left details of his experiences in his letters; Benedict founded the Benedictine Order in the 6th century on the model of Saint Pachomius, but in a stricter form. Countless pilgrims have visited the "Desert Fathers" to emulate their spiritual, disciplined lives. In the 4th century, an Alexandrian presbyter named Arius began a theological dispute about the nature of Christ that spread throughout the Christian world and is now known as Arianism. The Ecumenical Council of Nicea AD 325 was convened by Constantine under the presidency of Saint Hosius of Cordova and Pope Saint Alexander I of Alexandria to resolve the dispute and eventually led to the formulation of the Symbol of Faith, also known as the Nicene Creed. The Creed, which is now recited throughout the Christian world, was based largely on the teaching put forth by a man who eventually would become Pope Saint Athanasius of Alexandria, the chief opponent of Arius. When reports of this reached the Apostolic Throne of Saint Mark, Pope Saint Cyril I of Alexandria acted quickly to correct this breach with orthodoxy, requesting that Nestorius repent. When he would not, the Synod of Alexandria met in an emergency session and a unanimous agreement was reached. Pope Cyril I of Alexandria, supported by the entire See, sent a letter to Nestorius known as "The Third Epistle of Saint Cyril to Nestorius." This epistle drew heavily on the established Patristic Constitutions and contained the most famous article of Alexandrian Orthodoxy: "The Twelve Anathemas of Saint Cyril." In these anathemas, Cyril excommunicated anyone who followed the teachings of Nestorius. For example, "Anyone who dares to deny the Holy Virgin the title Theotokos is Anathema!" Nestorius however, still would not repent and so this led to the convening of the First Ecumenical Council of Ephesus (431), over which Cyril presided. When in AD 451, Emperor Marcianus attempted to heal divisions in the Church, the response of Pope Dioscorus – the Pope of Alexandria who was later exiled – was that the emperor should not intervene in the affairs of the Church. It was at Chalcedon that the emperor, through the Imperial delegates, enforced harsh disciplinary measures against Pope Dioscorus in response to his boldness. In 449, Pope Dioscorus headed the 2nd Council of Ephesus, called the "Robber Council" by Chalcedonian historians. It held to the Miaphysite formula which upheld the Christology of "One Incarnate Nature of God the Word" (Greek: μίαν φύσιν Θεοῦ Λόγου σεσαρκωμένην (mia physis Theou Logou sesarkōmenē), and upheld the heretic Eutyches claiming he was orthodox. The Council of Chalcedon summoned Dioscorus three times to appear at the council, after which he was deposed. The Council of Chalcedon further deposed him for his support of Eutyches, but not necessarily for Eutychian Monophysitism. Dioscorus appealed to the counciliar fathers to allow for a more Miaphysite interpretation of Christology at the council, but was denied. Following his being deposed, the Coptic Church and its faithful felt unfairly underrepresented at the council and oppressed politically by the Byzantine Empire. After the Byzantines appointed Proterius of Alexandria as Patriarch to represent the Chalcedonian Church, the Coptic Church appointed their own Patriarch Timothy Aelurus and broke from the Chalcedonian communion. From that point onward, Alexandria would have two patriarchs: the non-Chalcedonian native Egyptian one, now known as the Coptic Pope of Alexandria and Patriarch of All Africa on the Holy Apostolic See of St. Mark and the "Melkite" or Imperial Patriarch, now known as the Greek Orthodox Patriarch of Alexandria. The Coptic Orthodox Church of Alexandria regards itself as having been misunderstood at the Council of Chalcedon. There was an opinion in the Church that viewed that perhaps the Council understood the Church of Alexandria correctly, but wanted to curtail the existing power of the Alexandrine Hierarch, especially after the events that happened several years before at Constantinople from Pope Theophilus of Alexandria towards Patriarch John Chrysostom and the unfortunate turnouts of the Second Council of Ephesus in AD 449, where Eutichus misled Pope Dioscorus and the Council in confessing the Orthodox Faith in writing and then renouncing it after the Council, which in turn, had upset Rome, especially that the Tome which was sent was not read during the Council sessions. It is also to be noted that by anathemizing Pope Leo because of the tone and content of his tome, as per Alexandrine Theology perception, Pope Dioscorus was found guilty of doing so without due process; in other words, the Tome of Leo was not a subject of heresy in the first place, but it was a question of questioning the reasons behind not having it either acknowledged or read at the Second Council of Ephesus in AD 449. Pope Dioscorus of Alexandria was never labeled as heretic by the council's canons. Prior to Chalcedon, the Catholic Church had not suffered a single division or schism. After the Council of Chalcedon 451, the Coptic Church and it's hierarchy felt suspicious of what they believed were Nestorianizing elements within the Chalcedonian Church. As a result, the anti-Chalcedon partisan, Timotheos Aelurus, consigned himself to depose the Chalcedonian Pope of Alexandria, Proterius of Alexandria, and to set himself up as the Pope of Alexandria in opposition to the entire Chalcedonian Church and Byzantine Empire. Copts suffered under the rule of the Byzantine Eastern Roman Empire. The Melkite Patriarchs, appointed by the emperors as both spiritual leaders and civil governors, massacred those Egyptians they considered heretics. Many were tortured and martyred in attempts to force their acceptance of the Chalcedon terms, but the Egyptians remained loyal to the faith of their fathers and the Cyrillian view of Christology. One of the most renowned Egyptian saints of the period is Saint Samuel the Confessor. The position of the Copts began to improve early in the 19th century under the stability and tolerance of the Muhammad Ali Dynasty. The Coptic community ceased to be regarded by the state as an administrative unit. In 1855 the jizya tax was abolished. Shortly thereafter, the Copts started to serve in the Egyptian army. On 4 November 2012, Bishop Tawadros was chosen as the 118th Pope of Alexandria and the Patriarch of All Africa on the Holy See of Saint Mark. His predecessor was Pope Shenouda III, who died on 17 March 2012. In 1959, the Ethiopian Orthodox Tewahedo Church was granted its first own Patriarch by Pope Cyril VI. Furthermore, the Eritrean Orthodox Tewahedo Church similarly became independent of the Ethiopian Orthodox Tewahedo Church in 1994, when four bishops were consecrated by Pope Shenouda III of Alexandria to form the basis of a local Holy Synod of the Eritrean Church. In 1998, the Eritrean Orthodox Tewahedo Church gained its autocephelacy from the Coptic Orthodox Church when its first Patriarch was enthroned by Pope Shenouda III of Alexandria. According to Christian Tradition and Canon Law, the Coptic Orthodox Church of Alexandria only ordains men to the priesthood and episcopate, and if they wish to be married, they must be married before they are ordained. In this respect they follow the same practices as does the Eastern Orthodox Church and Syrian Orthodox Church. Traditionally, the Coptic language was used in church services, and the scriptures were written in the Coptic alphabet. However, due to the Arabisation of Egypt, service in churches started to witness increased use of Arabic, while preaching is done entirely in Arabic. Native languages are used, in conjunction with Coptic, during services outside of Egypt. Coptic Orthodox Christians celebrate Christmas on 7 January (Gregorian Calendar), which coincides with 25 December according to the Julian Calendar. The Coptic Orthodox Church uses the Julian Calendar as its Ecclesiastical Calendar. It is known as the Coptic calendar or the Alexandrian Calendar. This calendar is in turn based on the old Egyptian calendar of Ancient Egypt. The Coptic Orthodox Church is thus considered an Old Calendrist Church. Christmas according to the Coptic calendar was adopted as an official national holiday in Egypt in 2002. There are about 18 million Coptic Orthodox Christians in the world. Between 10 and 14 million of them are found in Egypt under the jurisdiction of the Coptic Orthodox Church of Alexandria. Estimates of the size of Egypt's Christian population vary from the low government figures of 6 to 7 million to the 12 million reported by some Christian leaders. The actual numbers may be in the 11 to 13 million range, out of an Egyptian population of more than 85. There are also significant numbers in the diaspora outside of Africa in countries such as the United States, Canada, Australia, France, and Germany. The number of Coptic Orthodox Christians in the diaspora is roughly 2 million. A 2010 New Year's Eve attack by Islamic fundamentalists on the Coptic Orthodox Church in the city of Alexandria left 21 dead and many more injured. One week later, thousands of Muslims stood as human shields outside churches as Coptic Christians attended Christmas Masses on 6 and 7 January 2011. 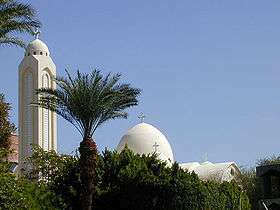 On 30 January 2011, just days after the demonstrations to reform the Egyptian government, Muslims in southern Egypt broke into two homes belonging to Coptic Christians. The Muslim assailants murdered 11 people and wounded four others. On 4 October 2011, military and police squads used force late at night to disperse hundreds of angry Coptic demonstrators and their supporters who were attempting to stage a sit-in outside the Maspero TV headquarters in downtown Cairo to protest attacks on a Christian church in Upper Egypt. Besides Egypt, the Church of Alexandria has jurisdiction over Pentapolis, Libya, Nubia, Sudan, Ethiopia, Eritrea and all Africa. Both the Patriarchate of Addis Ababa and all Ethiopia, and the Patriarchate of Asmara and all Eritrea do acknowledge the supremacy of honor and dignity of the Pope and Patriarch of Alexandria on the basis that both Patriarchates were established by the Throne of Alexandria and that they have their roots in the Apostolic Church of Alexandria, and acknowledge that Saint Mark the Apostlic is the founder of their Churches through the heritage and Apostolic evangelization of the Fathers of Alexandria. In other words, the Patriarchates of Ethiopia and Eritrea are daughter Churches of the Holy Apostolic Patriarchate of Alexandria. In addition to the above, the countries of Uganda, Kenya, Tanzania, Zambia, Zimbabwe, the Congo, Cameroon, Nigeria, Ghana, Botswana, Malawi, Angola, Namibia and South Africa are under the jurisdiction and the evangelization of the Throne of Alexandria. It is still expanding in the continent of Africa. Ethiopia received Christianity next to Jerusalem only a year after Jesus was crucified through its own apostle (Acts 8: 26–39). 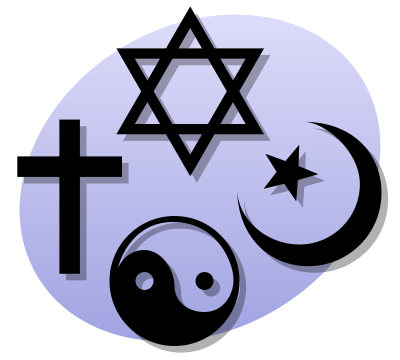 Christianity became a national religion of Ethiopia, under the dominion of the Church of Alexandria, in the 4th century. The first bishop of Ethiopia, Saint Frumentius, was consecrated as Bishop of Axum by Pope Athanasius of Alexandria in 328 AD. From then on, until 1959, the Pope of Alexandria, as Patriarch of All Africa, always named an Egyptian (a Copt) to be the Archbishop of the Ethiopian Church. 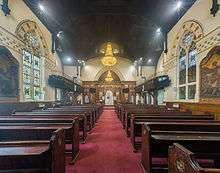 On 13 July 1948, the Coptic Church of Alexandria and the Ethiopian Orthodox Tewahido Church reached an agreement concerning the relationship between the two churches. In 1950, the Ethiopian Orthodox Tewahido Church was granted autocephaly by Pope Joseph II of Alexandria, head of the Coptic Orthodox Church. Five Ethiopian bishops were immediately consecrated by the Pope of Alexandria and Patriarch of All Africa, and were empowered to elect a new Patriarch for their church. This promotion was completed when Joseph II consecrated the first Ethiopian-born Archbishop, Abuna Basilios, as head of the Ethiopian Church on 14 January 1951. In 1959, Pope Cyril VI of Alexandria crowned Abuna Basilios as the first Patriarch of Ethiopia. The leader of the Coptic Orthodox Church of Alexandria, is known as Pope of Alexandria and Patriarch of all Africa on the Holy See of St. Mark the Apostle. The Bishop of Alexandria was first known just as the "Bishop of Alexandria". It continued to be so, until the Church grew within and all over the Egyptian Province, and many Bishops were consecrated for the newly founded parishes all over the towns and cities. The Bishop of Alexandria, being the successor of the first Bishop in Egypt consecrated by Saint Mark, was honored by the other Bishops, as first among equals Primus inter Pares. This was in addition to the appropriate honorary dignity, which was due by virtue of being the Senior Bishop of the main Metropolis of the Province, Alexandria, which also the Capital and the main Port of the Province. This honor was bestowed by making the Senior Bishop an "Archbishop," thus presiding in dignity of honor over all the Alexandrine and Egyptian Bishops. The appellation of "Pope" has been attributed to the Bishop of Alexandria since the Episcopate of Heraclas, the 13th Bishop of Alexandria. All the clergy of Alexandria and Lower Egypt honored him with the appellation "Papas", which means "Our Father," as the Senior and Elder Bishop among all bishops, within the Egyptian Province, who are under his jurisdiction. This is because Alexandria was the Capital of the Province, and the preaching center and the place of martyrdom of Saint Mark the Evangelist and Apostle. The title "Patriarch" means the Head or the Leader of a Tribe or a Community. Ecclesiastically it means the Head of the Fathers (Bishops) and their congregation of faithful. This title is historically known as "Patriarch of Alexandria and all Africa on the Holy Apostolic Throne of Saint Mark the Evangelist," that is "of Egypt." The title of "Patriarch" was first used around the time of the Third Ecumenical Council of Ephesus, convened in AD 431, and ratified at Chalcedon in AD 451. It is to be noted that only the Patriarch of Alexandria has the double title of "Pope" and "Patriarch" among the Eastern Orthodox and the Oriental Orthodox Thrones. 12 Metropolises, out of which 8 Metropolises are in Egypt, 1 Metropolis in the Near East, 2 in Europe, 1 in the USA; served by 2 Metropolitan Archbishops and 10 Metropolitan Bishops; out of the 12 Hierarchs, 1 Metropolitan Archbishop is in the Near East, 1 Metropolitan Archbishop in Egypt, while 7 Metropolitan Bishops are in Egypt, 2 Metropolitan Bishops are in Europe, and 1 Metropolitan Bishop in the USA. 65 Dioceses with 46 Diocesan Bishops are in Egypt, 9 Diocesan Bishops are in Europe, 4 Diocesan Bishops are in North America, 2 Diocesan Bishops are in South America, 2 Diocesan Bishops are in Sudan and 2 Diocesan Bishops are in Australia. 3 Suffragan Dioceses, with 1 Suffragan Bishop in Europe and 2 Suffragan Bishops in North America. 5 Auxiliary Bishops, with 3 Auxiliary Bishops for Dioceses in Egypt and 2 Auxiliary Bishops in North America. 9 Patriarchal Exarchates, with 2 Patriarchal Exarchs in Africa, 2 Patriarchal Exarchs in North America, 2 Patriarchal Exarchs in Europe and 3 Patriarchal Exarchs in Egypt. 2 General Bishops, Patriarchal Emissary at large in Egypt and abroad. 4 General Bishops, Administrators of Patriarchal Institutions in Egypt. 1 Hegumen in the capacity of Grand Economos, Patriarchal Vicar for Alexandria. 1 Hegumen as Administrative Patriarchal Vicar for Cairo. ↑ Coptic: Ϯⲉⲕ̀ⲕⲗⲏⲥⲓⲁ ̀ⲛⲣⲉⲙ̀ⲛⲭⲏⲙⲓ ̀ⲛⲟⲣⲑⲟⲇⲟⲝⲟⲥ ti.eklyseya en.remenkimi en.orthodoxos, literally: the Egyptian Orthodox Church. 1 2 Eusebius of Caesarea, the author of Ecclesiastical History in the 4th century, states that Saint Mark came to Egypt in the first or third year of the reign of Emperor Claudius, i.e. 41 or 43 A.D. "Two Thousand years of Coptic Christianity" Otto F. A. Meinardus p28. ↑ "Holy Family in Egypt". 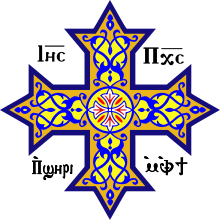 Orthodoxwiki.org. Retrieved 2 January 2011. ↑ "The Church of Alexandria". New Advent. Retrieved 17 March 2012. ↑ "The School of Alexandria – Part I – An Introduction to the School of Alexandria". Copticchurch.net. Retrieved 2 January 2011. ↑ "Split of the Byzantine and Oriental Churches". Webcitation.org. Archived from the original on 26 October 2009. Retrieved 2 January 2011. ↑ "Egypt". Berkley Center for Religion, Peace, and World Affairs. Retrieved 14 December 2011. See drop-down essay on "Islamic Conquest and the Ottoman Empire"
↑ Jerry Bentley, Old World Encounters: Cross-Cultural Contacts and Exchange in Pre-Modern Times (New York: Oxford University Press, 1993), 93. ↑ Jerry Bentley, Old World Encounters: Cross-Cultural Encounters and Exchanges in Pre-Modern Times (New York: Oxford University Press, 1993), 93. 1 2 3 "Saint George Coptic Church". Suscopts.org. Retrieved 2014-04-03. ↑ Official Statements on Christology. ↑ "Egypt". The World Factbook. American Central Intelligence Agency (CIA). 30 March 2016. Retrieved 5 April 2016. ↑ Abaza, Khairi; Nakhla, Mark (25 October 2005). "The Copts and Their Political Implications in Egypt". Washington Institute for Near East Policy. Retrieved 5 April 2016. ↑ Morrow, Adam (24 April 2006). 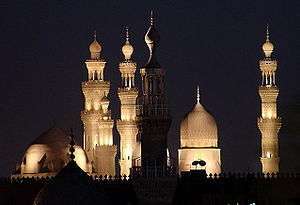 "Egypt: Attacks Raise Fear of Religious Discord". Inter Press Service. Retrieved 5 April 2016. ↑ Youssef, Abdel Rahman (30 September 2012). "Egyptian Copts: It's All in the Number". Al-Akhbar English. Retrieved 5 April 2016. ↑ "Egyptian Copts reject population estimate". Ahram Online. Retrieved 5 April 2016. ↑ "The Coptic Orthodox Church in action - Al-Ahram Weekly". weekly.ahram.org.eg. Retrieved 2016-05-06. ↑ Cairo, Jared Malsin in (2015-02-20). "'We want our sons back': fears grow for Egyptians missing in Libya". the Guardian. Retrieved 2016-05-06. ↑ "Egypt must help its poor in response to Libya beheadings, economists say". america.aljazeera.com. Retrieved 2016-05-06. ↑ El-Hennawy, Noha (24 June 2008). "EGYPT: Coptic diaspora spreads the word". Los Angeles Times. Retrieved 5 April 2016. ↑ Hassan, Abdel Salaam (1995). "The Copts". In Verney, Peter. Sudan: Conflict and minorities (PDF). Minority Rights Group International. p. 26. Retrieved 5 April 2016. ↑ "The Copts: Passive Survivors under Threat" (PDF). Africa Watch. 5 (3): 1. 10 February 1993. Retrieved 5 April 2016. ↑ WCC official visit to Ethiopia World Council of Churches – News Release. 21 September 2005. Retrieved 25 November 2006. ↑ Jensen, Jon. "Tensions high after Egypt church bombing". GlobalPost. ↑ "Alexandria church bomb: Egypt police on high alert". BBC News. 3 January 2011. ↑ "Blast at Coptic church in Egypt kills 21, sparks clashes between Christians, Muslims after New Year's Mass". msnbc.msn.com. Retrieved 28 February 2013. ↑ "Egypt Copts and Muslims come together for once during Orthodox Christmas". Latimesblogs.latimes.com. 8 January 2011. ↑ "Christians slaughtered in southern Egypt". Israel Today. Retrieved 28 February 2013. ↑ "Army uses force to disperse Copts protesting attacks on churches". English.ahram.org.eg. 5 October 2011. Retrieved 28 February 2013. ↑ "Egyptian Army Beating Protester". Therealnews.com. 5 October 2011. Retrieved 10 October 2013. ↑ Fahim, Kareem (20 March 2012). 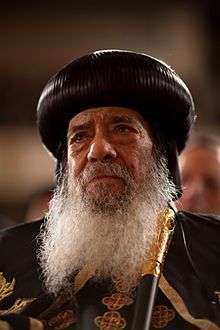 "Coptic Pope Shenouda III's Death Adds to Fears in Egypt". The New York Times. ↑ "Muslim Brotherhood Sweeps Up Over One-Third Of Votes In Egyptian Elections". Huffington Post. 4 December 2011. ↑ "Coptic Church Recognizes Martyrdom of 21 Coptic Christians". 21 February 2015. Retrieved 21 February 2015. ↑ "Saint Antony Coptic Orthodox Monastery". www.stantonymonastery.org. Retrieved 2015-09-06. The Chronicle of John, Bishop of Nikiu: Translated from Zotenberg's Ethiopic Text. R. H. Charles (translator). Evolution Publishing. 28 February 2007. ISBN 978-1-889758-87-9. Meinardus, Otto (1 October 2002). Two Thousand Years of Coptic Christianity. Cairo: American University in Cairo Press. ISBN 977-424-757-4. Partrick, Theodore (June 1996). Traditional Egyptian Christianity: A History of the Coptic Orthodox Church. Greensboro, NC: Fisher Park Press. ISBN 0-9652396-0-8. Butcher, E. L. (1897). Story of the Church of Egypt (in Arabic) (text file ed.). London: Smith, Elder & Co. ISBN 0-8370-7610-2.